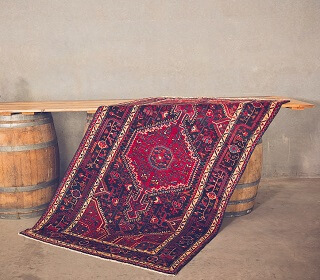 Vintage Persian rugs, aisle runners, throws, cushions and mats. Great for picnic and boho style seating, or team with our comfy lounges for an occasional seating area. When you’ve completed your Wishlist, don’t forget to submit it to us so we can get back to you with availability of your chosen items. Vintage Persian carpet aisle runner, blue and red geometric pattern. Approx. 4m long by 0.8m wide. Amazing as an aisle runner for a wedding ceremony. Medium red vintage Persian carpet/rug with blue and cream geometric detail, measuring 2.3m × 1.3m. Large red vintage Persian carpet/rug with cream and blue details, measuring 3m x 2m. Great for boho style floor seating or matched with one of our lounges. Extra large vintage Persian carpet/rug, mainly dark/midnight blue colour with silver, white and brown details. Measures 3m x 4m. Large pink vintage Persian carpet/rug/mat. Measures 2.4m x 1.7m. Great for boho style floor seating or matched with one of our lounges. Round woven “daisy” style jute mat/floor rug. Great to use as a base for a picnic eating nook or team with one of our lounges. Sisal aisle runner 4m long x 0.8m wide. We have two of these – we suggest hiring both to create a beautiful long aisle. Fairly thick matting with backing.